Whoohoo, we are finally heading into the fall season and I am super excited about it! There are so many fun festivals and events already in the works in my city, and surrounding areas that are fall-focused. I know we most look forward to the South Carolina State Fair which Starts in early October. I can already smell the elephant ears and buttery corn-on-the-cob! 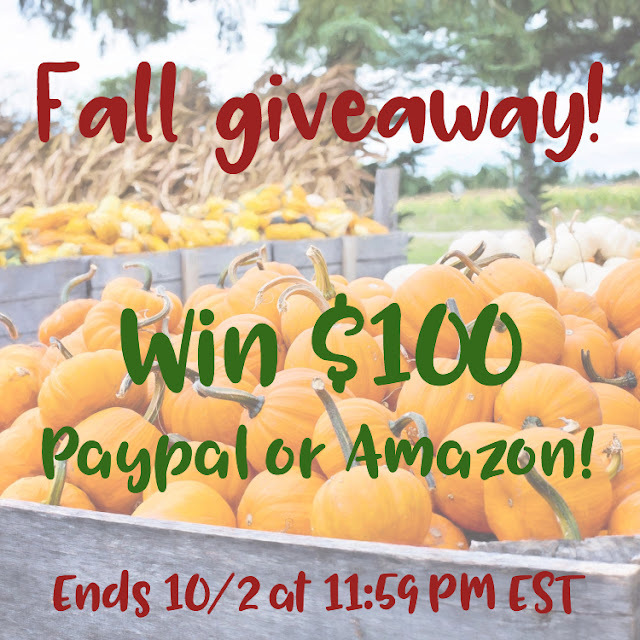 Sticking with the fall theme, I have teamed up with a fabulous group of blog friends to bring you another great giveaway to put some extra cash in your pocket as we head into a new season. Check out the details below and enter today. Good luck! How to enter: There are 10 Twitter accounts. Follow one or all but the more accounts you follow the more entries you’ll receive. If you’re already a follower of an account, claim that entry! This giveaway starts September 19 at midnight EST and ends October 2 at 11:59 PM EST. Entrants must be USA residents and at least 18 years old. One winner will be randomly selected from all qualifying entries and contacted via the email they provide. The email will come from joannegreco at gmail. The winner has 48 hours to respond or a new winner will be chosen. The prize is $100 in Paypal or Amazon online gift card, winner’s choice.